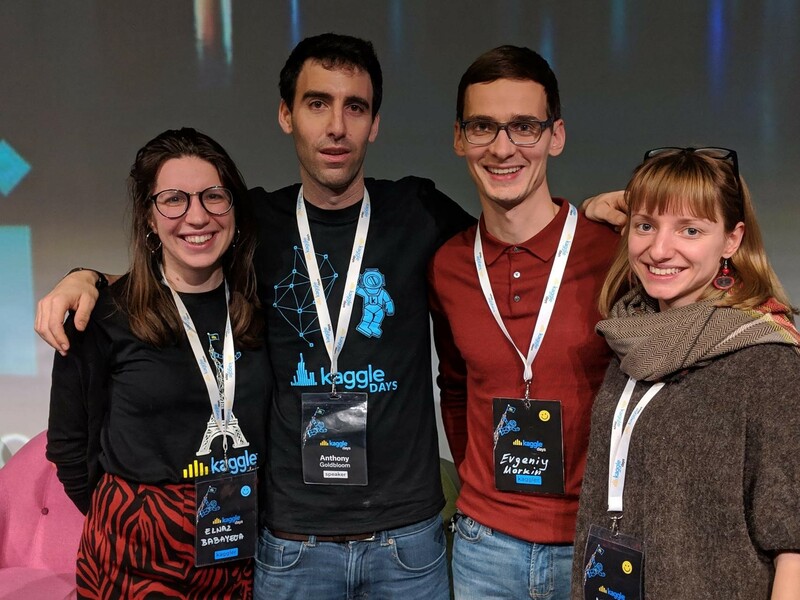 CTU students placed 7th out of 76 teams in the Kaggle Days competition on January 26, 2019 in Paris. Two Open Informatics students, Elnaz Babayeva and Anastasia Lebedeva, and a Data Management Specialist from Stains, UK, Evgeniy Markin, formed a team called #nukaktotak and competed with Masters and GrandMasters submissions from all over the world in an 11-hours hackathon! It was their first participation in Kaggle competition and already such a success - congratulations! Kaggle days is a yearly offline meetup of Kagglers all around the world. This time it was organized as one-day conference with lectures from Grandmasters and a hackathon the next day. The competition was provided by Louis Vuitton AI team, with the goal of predicting the sales of the items in the next three months. From left to right: Elnaz Babayeva, Anthony Goldbloom (CEO of Kaggle), Evgenii Markin and Anastasia Leabedeva.